Retail fertilizer prices tracked by DTN for the first week of November show the continued trend of higher prices. Anhydrous prices increased 6%, or $29/ton, from last month, with retail prices averaging $517/ton. Prices are 27% higher than last year. 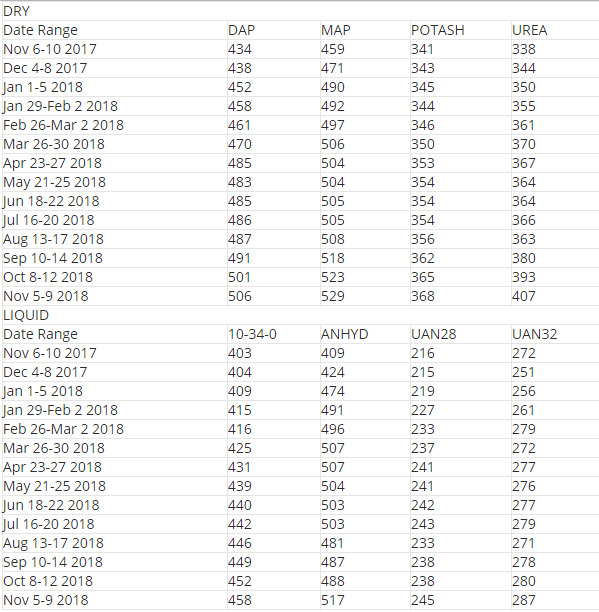 Anhydrous prices increased 6%, the most significant price move this week. The nitrogen fertilizer had an average price of $517/ton, up $29 per ton from the same time last month. It’s $108/ton higher than last year.